I love how they turned out and my family thought they were awesome too! Preheat your oven to 350°F. In small bowl, mix flour, baking powder, and salt. Set aside. Mix sugar and butter together until fluffy. Add eggs, one at a time until well combined. Add vanilla. Slowly add in flour mixture, alternating with milk until batter will well combined and smooth. Scoop into lined cupcake pan. Reduce heat on oven to 325°F and place cupcakes on middle rack of oven. Bake for 28-30 mins until toothpick comes out clean. Set aside to cool. Cream peanut butter and butter together, slowly add powdered sugar until well combined and smooth. Heat raspberries, sugar, and lemon juice over medium low heat. Sprinkle cornstarch on top. Stir until slightly thickened. Remove from heat and let cool. Using a melon baller or knife, cut out a dime size section of the cupcake. Spoon in the cooled Raspberry Jelly Filling, I used about a teaspoon and a teaspoon and a half, depending on how deep of a section I took out of the cupcake. Top with Peanut Butter Buttercream. Paula these look and sound so good! We are huge PB&J fans so I will definitely be trying these this week. You are killing my eating healthy goals though with all your amazing cupcakes lately! 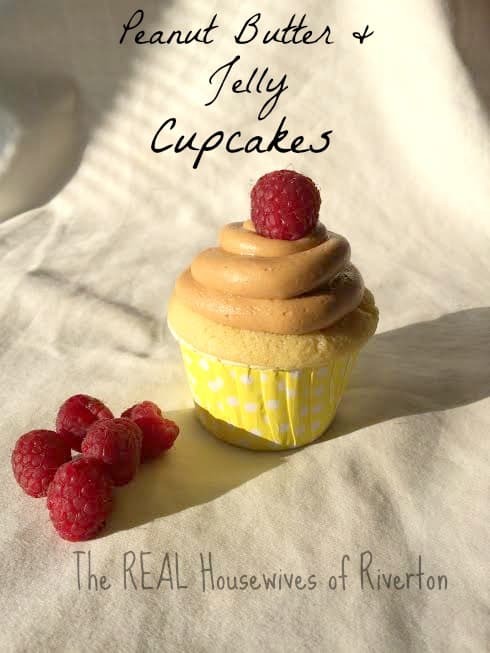 Love PB&J and how you incorporated it into cupcakes! Yummy! 😉 Pinned and tweeted, visiting form Lou Lou Girls!